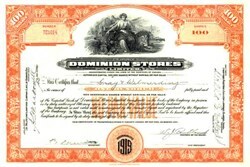 Beautifully engraved Certificate from the famous Canadian Dominion Stores Stock Certificate issued in 1929. 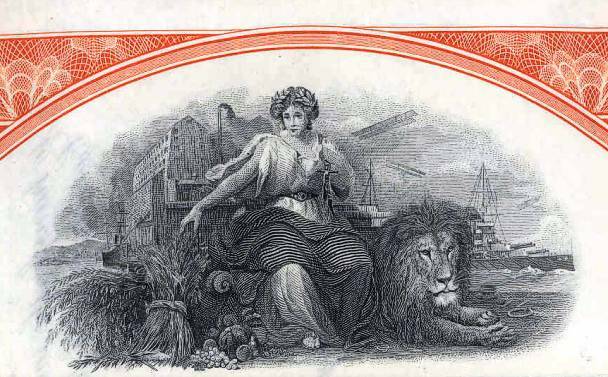 This historic document has an ornate border around it with a vignette of a woman, bi planes flying overhead and a lion on her side. This item is hand signed by the company's officers and is over 74 years old. The Great Atlantic & Pacific Tea Company, better known as A&P, purchased Dominion Stores Limited in 1985 and boosted the company's Canadian presence.